EDP Focus Groups provide a roadmap for the implementation of EDP, including the definition of industry activities and groups, the selection of stakeholders and business leaders to be involved in the EDP process, the communication of conclusions about opportunities and emerging innovation ecosystems, and the use of EDP conclusions by the regional and national authorities for drafting calls for actions. The mapping exercise found the following method relevant in the process of identifying priorities for action. Focus groups are a key method for RIS3 priority setting. The mapping exercise showed that 93% of the selected regions have used this method in refining their priority lists. Moreover, a large share of regions outline this as the only method used during this phase. The Entrepreneurial Discovery Process (EDP) is an exploratory and interactive bottom-up process which “allows mapping promising sectors for investment and domains for future competitiveness” (Periañez-Forte et al., 2016). EDP “is about prioritising investment based on an inclusive and evidence-based process driven by stakeholders’ engagement and attention to market dynamics” (Periañez-Forte et al., 2016) and it can be considered a pillar of the S3 methodology, as well as one of its main distinguish feature (Santini et al. 2016; Mieszkowski and Kardas, 2015; Martínez-López and Palazuelos-Martínez, 2014). In order to be activated, this process “requires governments to provide a dedicated management and to act as platforms to enable, sustain and guide stakeholders’ participation across the policy-making process” (Periañez-Forte et al. 2016). Different entrepreneurial actors are brought together in a government-led participatory process to jointly identify fields with smart specialisation potential and define possible activities for preparing their progressive development (Del Castillo Hermosa et al. 2015; Periañez-Forte et al. 2016; Santini et al. 2016). It is important to note that entrepreneurial actors are not only businesses, but any organization and individual with an entrepreneurial knowledge that can be used to acquire a systematic understanding of “the most promising areas for future regional development” (European Commission, 2012). The engagement of stakeholders therefore needs to be as broad as possible, and requires an approach based on a Quadruple-Helix Innovation Model, in which industry, education and research institutions, and government collaborates with the civil society (Carayannis and Grigoroudis, 2016; Martínez-López and Palazuelos-Martínez, 2014; European Commission, 2012). As reported by Cavallini et al. (2016): “participation of a fourth group of actors is meant to include the demand-side perspective, i.e. the perspective of users, in the strategy development process. The inclusion of this fourth group is believed to strengthen the innovation process in general […] and the entrepreneurial discovery process in particular, as the needs of citizens are better understood and taken into account. The RIS3 guidance document makes a point of emphasizing how the consideration of this fourth group of actors may result in securing better conditions to commercialize R&D efforts”. EDP Focus Groups are therefore important tools that public authorities can use for facilitating the EDP’s progressive development. These events are instrumental in generating a collective debate, integrating the divided and dispersed knowledge belonging to different actors, and setting common priorities for intervention. The two EDP approaches tested respectively by World Bank in Poland (Piatkowsk et al. 2015) and the Joint Research Centre’s Institute of Prospective Technological Studies (JRC-IPTS) in Greece (Santini et al., 2016; Marinelli et al., 2016; 2017; Haegeman, 2016; Boden et al., 2015a; 2015b) provide useful information regarding the structure and development process of EDP Focus Groups. Both approaches are discussed in the following paragraphs. Between 2012 and 2014, the managing authority of the Greek Region of Eastern Macedonia and Thrace (REMTh) began developing its Smart Specialization Strategy (S3) by identifying a group of horizontal and thematic priorities. “The identification of these areas of intervention represents the necessary and preliminary step to allow RIS3 implementation” (Marinelli et al., 2016). Starting from the results of this activity, the JRC-IPTS and other partners in the region decided to collaborate and develop a series of four EDP Focus Groups, “each focused on one of the region’s S3 priorities and aimed at generating innovative ideas through the interaction between business, public and research sectors, but with a set of common aims: to bring together relevant stakeholders in the sector […]; to explore and catalyze the dynamics of the entrepreneurial process of discovery; to increase the understanding of the need [and] select a limited number of priorities; to build trust among stakeholders […]; to examine key criteria to identify and pursue relevant projects for the region; to collect ideas for regional innovation that combine regional strengths with international and emerging trends; to shape initial partnerships around those ideas [and] foster a culture of collaboration […]; to increase awareness of the international context of regional innovation activities” (Marinelli et al., 2016). The REMTh’s S3 priorities are Wine, Meat & Dairy, Tourism, and Marble & Non-Metallic Minerals. EDP Focus Groups took place between November 2014 and May 2015. The organization of the four events required extensive preparation: a desktop-based research phase was conducted to analyze the value chain of each sector and identify the main topics for discussion, together with the relevant regional, national and international stakeholders belonging to industry, academia and national and regional administrations to be invited (Santini et al., 2016; Marinelli et al., 2016; 2017; Boden et al., 2015a). Each EDP Focus Group lasted approximatively between one and two days, and all of them were structured following the same template-agenda, which is illustrated in Table 3. However, “the methodological approach […] has been progressively refined in view of continued replication and adaptation” on the base of the lessons derived from each event (Marinelli et al. 2016). The agenda is composed by two plenary sessions and some interactive parallel sessions (Table 4). The plenary sessions took place at the beginning and end of the event and include “an introduction to the regional RIS3 and to the project, one or two presentations from reputable international speakers, and time for open discussion”. The parallel sessions cover “different segments of the value chain of each sector” and include also “a presentation from national and international experts in the field and a phased participatory exercise” (Santini et al., 2016). The presentations from national and international experts on relevant topics are used as scene-setting tools for stimulating the discussions around the themes identified during the preparation phase. Moreover, as reported by Boden et al. (2015a), the duration of each event is selected by considering the need to have “sufficient time for full parallel discussion [and enhance] the general networking opportunity of the event”. Participants to the parallel sessions are grouped in consideration of their expressed preferences but at the same time there is also a mix of stakeholders from: within and outside the region; different counties; the public and private research sectors; organizations working in different sections of the sector’s value chain. Moreover, the groups are set up by considering the knowledge background and skills of each stakeholder to balance the presence of people with different perspectives, which are linked to four areas: policy perspective; strategic perspective; scientific perspective; and technological perspective (Santini et.al., 2016; Boden et al., 2015a). The parallel sections are composed of five main phases, which are described in Table 5, and aimed at: “generating and selecting innovative ideas requiring expertise from different sectors […]; creating partnerships around them and reflecting on their potential development […]; and outlining the first necessary steps for implementation” (Santini et al., 2016). Moreover, a moderator is assigned to each discussion group and is asked to: manage the debate; report the session’s outcomes to the plenary; and carry out some follow up activities. These activities include informing participants about future steps by sending emails and updates on the website of the REMTh’s managing authority with information and news related to the EDP Focus Group (Boden et al., 2015a). Each participant is asked to present her/his idea to the rest of the group, highlighting the profile of the expertise needed for its further development. To ensure an open and creative environment, ideas are not criticized at this stage. 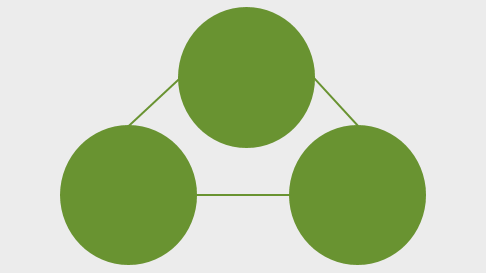 Each parallel group, building on the outcomes of task 2, creates a consolidated list of ideas in which similar or complementary proposals are clustered. Following that, participants are asked to identify those idea(s) which they are interested in developing further. Based on that, the group – guided by the moderator – proceed to organize itself in different sub-groups or “idea-partnerships”. These comprise (ideally) individuals from different sectors (i.e. research and industry) with similar interests. Each of the ‘idea-partnerships’ formed in task 3 then discusses the idea further, defining it in more depth, identifying the required contributions from different partners, developing the first considerations on framework conditions (legal problems, needs for human capital, capacities, etc. ), on financial planning and on the next steps. The ‘idea-partnerships’ then define the concrete title for their ideas, the subsector(s) of interest, a brief project description, a rough estimation of the resources needed, a timeline, and the stakeholder groups involved. The work is conducted under a set of guiding questions. The criteria for funding are considered. The main outcomes produced by the EDP Focus Groups are a set of entrepreneurial ideas. After the four events, these ideas are systematically collated and then further explored and analyzed during two Project Development Labs and an open online consultation (Haegeman, 2016). As explained by Marinelli et al. (2016): “These [activities] aimed at further refining ideas from the EDP Focus Groups and taking them closer towards implementation, identifying funding opportunities and action plans for policy. The first PDL sought to translate stakeholder engagement into policy actions and brought together JRC-IPTS and its expert partners, the Managing Authority, representatives of regional and national government with expertise on S3, ESIF and state-aid regulations, and representatives of regional higher-education and research organizations. The event focused on the administrative dimensions of the EDP ideas, covering issues related to effectiveness, appropriateness, delivery mechanisms, project selection criteria, fitness to the national RIS3, state aid rules and their implications for launching calls. Building on the first, the second PDL then sought to examine how stakeholder engagement in the first PDL fed back into the policy process, and included a presentation and discussion of draft calls. It also explored the possibility of financing EDP ideas (or some of their components) from other funding sources, such as Horizon2020”. The report published by Piatkowski et al. (2015) shows that in Poland, the World Bank has adopted a similar approach for the implementation of the EDP Focus Groups, called Smart Labs. Even in this case, a preliminary phase based on desktop research is conducted, together with a high number of semi-structured interviews. These activities are aimed at identifying and analysing potential economic areas for Smart Specialization, identify champions and relevant stakeholders with an entrepreneurial knowledge about such areas. Champions represent regional businesses with a high innovation-based growth potential in one of the potential Smart Specialization areas and a strong interest in supporting its development. The Smart Labs are then implemented to discuss and validate the potential of each business area and prepare a midterm strategy for its future development. This is achieved by following the procedure shown in Figure 11, in which the Smart Lab process is described. Here each potential Smart Specialization’s area is explored progressively, thanks to a sequence of focus groups the continuance of which depends on the results achieved with the previous one. During the first Smart Lab, members define the business area and prepare a SWOT and/or a value-chain analysis (VCA). Moreover, they are asked to identify the key success factors. “Participating companies are [then] asked to indicate their R&D needs and perceived market trends”. 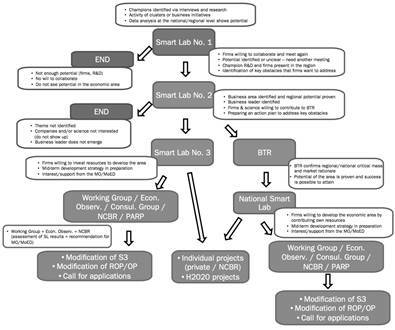 The answers are used to set up the second Smart Lab, which “showcases the scientific potential of regional [research and development institutions and] universities within a given business area in the context of R&D needs and market trends identified by companies participating in the initial [Smart Lab]”. This second meeting can also be used to better define the purpose of the Smart Lab process and “should conclude with a joint vision of development of the business area. Depending on the results of the second [Smart Lab], a business-technology roadmap (BTR) is subsequently prepared by an external expert(s) in collaboration with a [Smart Lab] business leader. The BTR analyzes market and technology trends for the business area and proposes a roadmap for development based on R&D and innovation. The third Smart Lab is organized […] to verify the BTR’s proposed development vision for the business area. Additional […] Smart Labs are organized, if needed”. (Piatkowski et al., 2015). Each Smart Lab has a maximum duration of four hours, is moderated by a regional consultant, and is comprised of between 15 and 20 participants: 8-10 entrepreneurs, 3 universities/ research institutions, 3 business support institutions, and representatives of the regional and national government. Entrepreneurs are selected considering the champion companies identified during the interview process. Representatives from universities/research institutions are instead selected among those with sufficient experience in working with business. The Labs are attended only by those who have been invited. The follow up activities implemented after each Smart Lab include: preparing a report with proposals for next steps; publishing the report online to share knowledge even with actors not involved in the Lab; capturing participants’ ideas for cooperation and their evaluation of the focus group with a survey. The EDP Focus Groups help identify and test potential business areas for Smart Specialization and prepare a midterm strategy for their development by using a bottom-up and participatory approach based on 4-helix innovation model. The activities undertaken by World Bank and the JRC-IPST made it possible to codify a possible approach for implementing these events in an effective way, which can be replied in any regional context (Santini et al., 2016; Marinelli et al., 2016; 2017; Boden et al., 2015a; 2015b; Piatkowski et al., 2015). This approach is presented in the final section and is structured combining the insights and empirical knowledge gained from both case studies. No relevant data sources can be identified for this method. Based on the potential R3 area of the region, a desktop-based research phase is conducted which aims to analyze their value chain and identify either the main topics for discussion or the relevant regional, national and international stakeholders to be invited ot the EDP Focus Group process. These stakeholders can belong to industry, academia and national/regional administrations.. These activities are implemented for each R3 area that needs to be subjected to a thematic EDP Focus Group. After being identified, the stakeholders are contacted to establish their willingness to participate. The template-agenda described in Table 1 is used to plan each thematic EDP Focus Group. A moderator for each parallel session of the event is identified and a set of guiding questions is set up for each parallel session to guide the debate and stimulate participants in proposing ideas. The thematic EDP Focus Groups are held and the ideas emerging from the parallel discussions are collected, organized and presented to the participants. The parallel sessions are structured in 5 main phases, as described in Table 3. Participants are distributed so that groups are composed of actors from: within and outside the region, and different countries also; public and private research sectors; organizations working in different sections of the sector’s value chain. The knowledge background and skills of each stakeholder are considered, balancing the presence of people with different perspectives (policy perspective; strategic perspective; scientific perspective; and technological perspective). The duration of each event is between one and two days. The ideas acquired during the thematic EDP Focus Groups are systematically collated and further explored and analyzed during two transversal meetings. During these meetings, attention is focused on the administrative dimensions of the EDP ideas, covering issues related to effectiveness, appropriateness, delivery mechanisms, project selection criteria, fitness to the national RIS3, state aid rules, and funding possibilities. The results of the process are then subjected to an open online consultation to broaden participation and get new suggestions not only from participants but also from those actors which have not been directly involved in the EDP Focus Groups process. Reports are produced and shared online. Participants are informed about future steps via email, and updated with information and news related to the EDP Focus Groups using digital tools. Participants’ evaluation of the EDP Focus Groups is captured with a survey. A preliminary research phase is conducted based on desktop research and interviews. The goal of this phase is to: identify and analyze potential R3 actors; identifying business champions and other relevant regional, national and international stakeholders belonging to industry, academia and national and regional administrations to be invited to the EDP Focus Groups. These activities are implemented for each R3 area that is to be subjected to a specific EDP Focus Group. After being identified, the stakeholders are contacted to establish their willingness to participate. Only a restricted number of actors are invited to participate. The ideal group is composed of 15-20 participants: 8-10 entrepreneurs (business champions), 3 universities/research institutions, 3 business support institutions, and representatives of the regional and national government. A sequence of three of more EDP Focus Groups is organized for each business area, until a joint vision of development of the business area is acquired. The process is halted if the area does not show enough potential for growth after the first or the second meeting. The first EDP Focus Group is used for exploring the business area and preparing a SWOT and/or a value-chain analysis. Moreover, participants are asked to identify the key success factors and indicate the R&D needs and perceived market trends. The results are used to establish the second Focus Group, which is instrumental in exploring the scientific potential of regional research and development institutions and universities within the business area. This second meeting should conclude with a joint vision of development of the business area or the process is terminated. Depending on the results of the second meeting, a business-technology roadmap is subsequently prepared by one or more external experts in collaboration with a business leader of the area, which is identified during the first and second meeting. The third EDP Focus Group is organized to verify the BTR’s proposed development vision for the business area. Additional meetings are organized if necessary. Each meeting has a duration of about 4 hours. A report with proposals for next steps is produced after each EDP Focus Group and published online to generate public knowledge and reduce the coordination failure among the sector’s stakeholders. Next steps are clearly communicated to participants, and their evaluation of the EDP Focus Group is captured with a survey. Boden, M., Marinelli, E., Haegeman, K., & Dos Santos, P. (2015a). Bridging Thinkers and Doers: First Lessons from the Entrepreneurial Discovery Process in Eastern Macedonia and Thrace. Luxembourg: Publications Office of the European Union. Boden, M., dos Santos, P., Karel, H., Marinelli, E., & Valero, S. (2015b). European Parliament Preparatory Action: “Actual and Desired State of the Economic Potential in Regions Outside the Greek Capital Athens”. Report. European Commission – JRC. http://s3platform.jrc.ec.europa.eu. Accessed 08.11.2016. Carayannis, E., & Grigoroudis, E. (2016). Quadruple Innovation Helix and Smart Specialization: Knowledge Production and National Competitiveness. Foresight and STI Governance, 10(1), 31-42. Cavallini, S., Soldi, R., Friedl, J., & Volpe, M. (2016). Using the Quadruple Helix Approach to Accelerate the Transfer of Research and Innovation Results to Regional Growth. European Union – Committee of the Regions. http://cor.europa.eu/en/documentation/studies/Documents/quadruple-helix.pdf. Accessed 08.11.2016. Del Castillo Hermosa, J., Elorduy, J. P., & Eguía, B. B. (2015). Smart Specialization and Entrepreneurial Discovery: Theory and Reality. Revista Portuguesa de Estudos Regionais, 39, 5-22. European Commission (2012). Guide to Research and Innovation Strategies for Smart Specialisations (RIS 3). Luxembourg: Publications Office of the European Union. Haegeman, K. (2016). Experiences from RIS3 Support in Eastern Macedonia and Thrace. Presentation. European Commission. http://www.adrnordest.ro. Accessed 08.11.2016. Marinelli, E., Boden, M., & Haegeman, K. (2017). Implementing the Entrepreneurial Discovery Process in Eastern Macedonia & Thrace. In D. Kyriakou, M. Palazuelos Martínez, I. Periáñez-Forte, & A. Rainoldi (Eds. ), Governing Smart Specialisation (pp. 132-155). New York, NY: Routledge. Marinelli, E., Boden, M., Amanatidou, E., & Tolias, Y. (2016). Stakeholders’ Engagement Beyond the EDP: The Working-groups on Governance and Human Resources in Eastern Macedonia and Thrace. Smart Specialisation Policy Brief. European Commission – Joint Research Centre. http://s3platform.jrc.ec.europa.eu. Accessed 08.11.2016. Martínez-López, D., & Palazuelos-Martínez, M. (2014). Breaking with the Past in Smart Specialisation: A New Model of Selection of Business Stakeholders Within the Entrepreneurial Process of Discovery. Working Paper. http://infogen.webs.uvigo.es. Accessed 08.11.2016. Mieszkowski, K., & Kardas, M. (2015). Facilitating an Entrepreneurial Discovery Process for Smart Specialisation. The Case of Poland. Journal of the Knowledge Economy, 6(2), 357-384. Periañez-Forte, I., Marinelli, E., & Foray, D. (2016). The Entrepreneurial Discovery Process (EDP) Cycle: From Priority Selection to Strategy Implementation. In C. Gianelle, D. Kyriakou, & C. Cohen (Eds. ), Implementing Smart Specialisation Strategies: A Handbook (pp. 12-35). Luxembourg: Publications Office of the European Union. Piatkowski, M., Wolszczak, G., Toborowicz, J., Sacha, W., Haven, T., Klupa, A., Wojtkowska, J., Sadowska, A., Matusiak, M., Borowik, I., Perek-Bialas, J., Worek, B., Zwierzchowski, K., Kaminska, K., Skierska, A., Rola-Janicka, M., Trusz, W., Podebry, J., Szuba, T., Lindholm, P., Kagan, A., Sheffrin, R., Geffroy, P., Parsons, P., Wiatr, D., Lada, R., Knaflewski, S., Pietka, T., Hejka, A., Housh, T., Bartoli, C., Kowalski, M., Siwek, A., Jablonski, W., & Rudawska, J. (2015). Toward an Innovative Poland: The Entrepreneurial Discovery Process and Business Needs Analysis. Report. World Bank. http://documents.worldbank.org. Accessed 14.11.2016. Santini, C., Marinelli, E., Boden, M., Cavicchi, A., & Haegeman, K. (2016). Reducing the Distance Between Thinkers and Doers in the Entrepreneurial Discovery Process: An Exploratory Study. Journal of Business Research, 69(5), 1840-1844.